It’s a lot of fun to be towed around in inflatable crafts by a boat, however wouldn’t you rather be flying as opposed to just being dragged on top of the boring water? With the Flying Manta Ray Inflatable you can do just that! 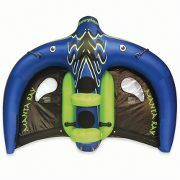 This inflatable floats just like any regular towable toy, however it features specially designed wings that allow you to soar above the surface of the water. The greatest thing about it is that it isn’t powered by anything but the speed of the boat! The craft can become airborne at just 23 miles-per-hour so you don’t have to risk your life (too much ;)) to go for a sweet ride. It can reach heights of 3 feet above the water, however going faster to reach higher altitudes isn’t safe. There are two seats with safety straps so two people can safely ride the inflatable at a time. There is also a rope bridle so so the rider can have control of the tilt and direction on the water. It also has a double hull so the craft has increased stability and strength. This fun gadget is unfortunatley rather expensive, however, costing $499.95. If you think it’s worth the money to start flying, however, you should be able to get one from Hammacher sometime soon. Solar Powered, Motion Sensing Security Camera!